This affordable high quality kit fits all 200cc engines. It features aluminum fins for optimum cooling and expansion properties, a re-boreable cast iron liner, four transfer ports for improved power throughout the rev range, stage 3 intake and exhaust port timings for excellent midrange torque, and a high quality piston with three 2mm rings for reliable long range durability. The kit accepts standard intake and exhaust manifolds, with power output in the 12-13hp range, or 14-15hp can be achieved with a larger carb (up to 28mm), and an expansion chamber system. For use with a stock or mildly milled 200cc cylinder head (not included). 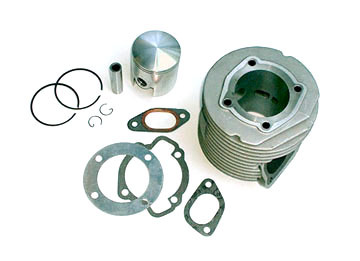 The kit as shown includes cylinder, piston assembly and all necessary gaskets.